Local celebrity chef Janice Wong expands her empire with a new restaurant at National Museum of Singapore. Gen T visionary and chef Janice Wong proves that she’s more than just a dessert queen with the launch of her eponymous restaurant serving dim sums and noodles, alongside her signature sweets. Chef Janice Wong merges her two loves—sweet and savoury—at her latest restaurant in the National Museum of Singapore. The highlight here is the modern Chinese cuisine (rainbow-coloured dim sums, anyone? ), but the chef has not forgotten her pastry background and has jazzed up the space with edible artworks and dedicated a section to a retail shop filled with all things sweet. You know what they say: you eat with your eyes first. 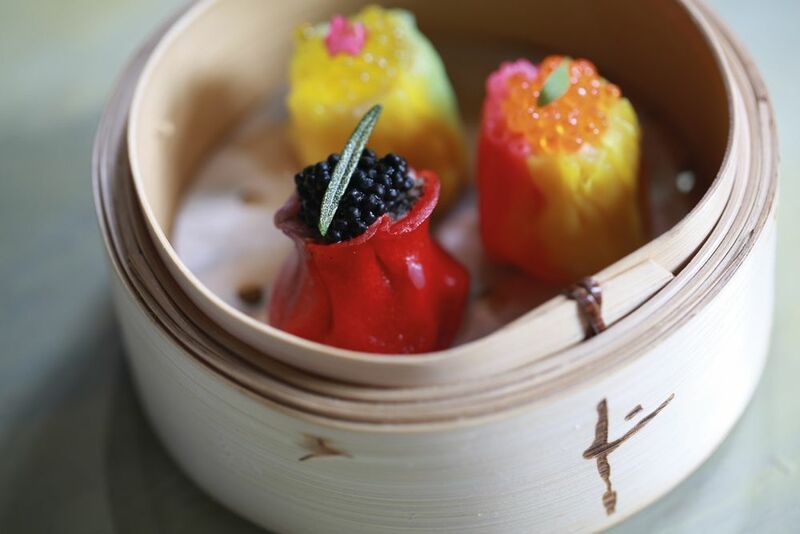 Whet your appetite with the delectable siew mai (which looks more like dessert) wrapped in colourful and slightly thicker skin. One basket gives you three varieties: the meaty shrimp and ham is topped with a dollop of caviar for extra indulgence, while the foie gras cherry gives a burst of buttery flavours with just the right sweetness. Last but not least, the light and addictive portobello rosemary caviar is packed with earthy mushroom bits. Slurp the piping hot Charcoal Nest black noodles, which comes with homemade slices of pork belly and a sheet of mushroom paper inscribed with the chef’s favourite poem. Served in a bowl, the golden collagen broth is poured at the table. Let it sit for a few minutes to allow the mushroom paper to melt for a touch of earthiness. The soft and chewy noodles absorb the flavours of the broth to make this one memorable dish. Vegetarians, rejoice! There’s a selection of dishes made especially for you, such as the basil barley noodles. An eye-catching option, thanks to its vibrant green colour, it is lightly seasoned with salt and pepper and mixed with sauteed mushrooms, bell pepper and curry leaves. You can’t leave a Janice Wong establishment without trying the desserts. But if you only have space for one, the strawberry caprese is the one to go for. What you get is a cotton candy pink ice cream, topped with fresh fruits, chewy sakura pearls, and drizzled with light strawberry syrup. Chef Wong skilfully plays with different flavours, adding chartreuse to the equation for a hint of alcohol.